Our films are available to screen in your home to small groups. Pricing is based on the number of attendees and whether or not you plan to publicly advertise and charge admission. With in-home screening rights we include a copy of the film and hi-resolution images. Please keep in mind that no screening is too small for possible filmmaker participation to facilitate dialogue surrounding the film's topics. Public Performance Rights (PPR) allow organizations, libraries and non-profit groups to exhibit our films to groups of approximately 50 or fewer individuals where admission is not charged. The term of the Public Performance (PPR) license is for the life of the DVD. A PPR license comes with a copy of the film and hi-resolution images to get the word out to group members. Ideal for libraries, colleges, film clubs, beekeeping groups, environmental awareness groups, and more! If you have any questions about what type of screening you should host, or to book a screening, please contact us directly by phone at (212) 629-6880 or email Serena Koch. 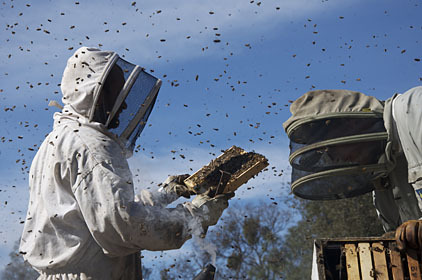 The American Beekeeping Federation is an excellent educational resource. Explore ABF's website to learn more about honeybees, pollination, Colony Collapse Disorder, honeybee-related legislative activities, free beekeeping information, and more. You can also check out news about bees, including commentary and archival articles, on the The New York Times website's Bee News Section and Bee Source's Beekeeping News.